Hi friends...happy Thanksgiving Eve! What do you have planned for the holiday? Todd and I are spending a few days with his parents and I'm really looking forward to it! It will be nice to spend time relaxing with family...and eating lots of food, of course! Express is the place to shop if you have a holiday party to attend this year! They have an awesome selection of party dresses. The entire store is 50% off right now plus free shipping on all orders!! This cut-out trapeze choker dress is the perfect color for the holidays and the choker detail is right on trend. I also love the fit and flare style. It comes in several colors and is on sale for $24.95! I wore sheer black tights underneath to make it more appropriate for the season, but it does look good with bare legs, too. A clutch is my go-to accessory for a holiday dress. There are a lot of purse styles that would work with this outfit, but I think a clutch always dresses up your look! This leopard fold over clutch is from Le Boutique Shop and looks like the designer version, but for way less! I love to pair a dress around the holidays with a chic pair of closed toe pumps! These gorgeous burgundy BCBG pumps are the perfect match for this dress. I love the unique cutout detail and rich color. These showstopping heels are a holiday must-have! For jewelry, I wore gold to match the clutch and zipper detail on the pumps. 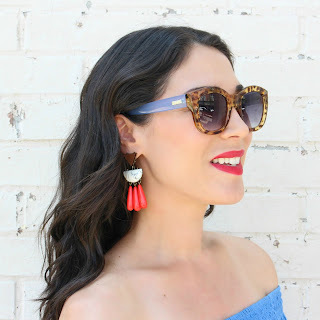 These Hazel & Deene statement earrings are my favorite. I HIGHLY recommend them!! They are big but very lightweight. There is also a matching necklace and the set is gorgeous together! Plus, they make a beautiful gift for her! I'm super excited to tell you all that my Boho Betty leopard cuff bracelet is 50% off and only $12.50! If you've read recent posts, you've seen me wear this unique cuff before. I love that it looks like a bracelet stack but is only one bracelet! This cuff makes a great holiday gift...and when you shop my Boho Betty page you get 20% off with code STYLEINHARMONY! Are you guys Black Friday shopping this year!? I'm hoping to get some time in the next few days to post the best sales for you all! Perfect look for a holiday party for sure. Oh, I love this color on you! What a fabulous find of a dress too. I like how you styled it with those shoes and that leopard clutch. Perfect! If you are looking for party wear you can get easily on Amiclubwear Dresses where you can also save maximum money through using free codes. If you are tired of being single and want to get mingle then you visit best dating apps and have fun with the perfect match for you. KINDLE CUSTOMER SERVICE are providing the more with some help for the worldwide user.